Stitch Sampler [W1528] - $7.00 : Yarn Tree, Your wholesale source for cross stitch supplies. Cross stitch pattern by Needle Bling Designs. 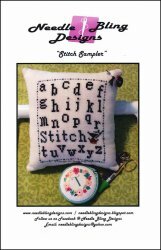 "Stitch Sampler," features the alphabet. Between the rows m,n,o,p,q r & t,u,v,w,x,y & z, "Stitch," is stitched. Stitch count 65h x 55w.